I don't think at all about the volume of artists making music and whether or not this means what I am doing is original. I guess because I come from totally outsider music, my problem is not so much that other people are doing what I do, but probably more that what I do is considered totally weird. In terms of areas of potential originality and communities I find inspiring, it is definitely for me more the field recording side of things I find theoretically and conceptually the most interesting. So the writings on sound and place, listening and field recording coming out of CRiSAP in London I've found very useful for my own work. Writings on place, emotionality and memory, for example, I'm reading The Memory of Place by Dylan Trigg right now. I find academic and creative writing on field recording, place and affect all very useful and inspiring. There are two pieces coming out for Tiny Portraits, a project I am doing with my label on place, memory and sound by Jacqueline George the other by aag which is amazing on the field recording side of things. George's piece reflects on the Shobra district of Cairo, and it's a swirling mix of calls to prayer, hawkers, shop music and bustle, and I absolutely love it. While aag, who is a Mexican artist, is using the sounds of a street protest about the 43 missing, presumed murdered students from Ayotzinapa which took place in Mexico City. Both these pieces I find conceptually and sonically incredible. They speak to sound and space, sound and cities, sound and politics, sound and architecture, sound and the state, sound and relationships between people, sound and the possible, sound and potentiality. There are lots of other labels and artists I find very inspiring. On labels, just to mention a few, Unfathomless, Dronarivm, Helen Scarsdale, Galaverna, Gruenrekorder and 12k. Artists of course there are so many, but Jason Lescalleet, Jim Haynes, Siavash Amini, Zenjungle, Foresteppe, Manrico Montero, Marc Fischer and Darren Harper spring to mind. I don't separate these at all. Given I'm not a musician almost all my composing is improvised and not readily repeatable. I feel like in some ways I've already spoken about these themes in my work, but one new focus I am currently developing is centred on rebroadcasting sounds within particular architectural or natural environments. I was in France recently and had access to an unused church where I spent many evenings broadcasting, recording, and rebroadcasting drones and sine tones. I've also been investigating this process in underwater environments using a quite specialised set up. I'm very interested in the ways sounds are shaped by their journeys through particular places, and I love Brandon LaBelle's writings where he talks about the ways a sound 'never forgets' all the surfaces and bodies it encounters as it makes its way from source to listener. In my explorations of rebroadcasts I am looking for the distinctive ways that places shape sound. In my childhood and also early adulthood I was very interested in visual arts. I loved and did graffiti, stencil art, and later installation, graphic arts and photography, so I come from a visual heritage which I guess in some ways is reflected in some of my design work for Flaming Pines. For a long time though I was very happy to have my own work solely focused on sound, but over the last two years I've found myself missing a visual element to my work. I've been looking at different ways to incorporate a visual element in my sounds, and I've started making film clips for my work. I don't have an opinion on some sort of definitive relationship between sound and other art forms, because I think these relationships can take an infinite number of forms. But for me what has always attracted me to sound, and why I moved towards it from my visual arts background was its ephemerality, its emotional immediacy and the personal and private ways it can be delivered and shared. I think for me the visual work I am doing, particularly in terms of the film clips I have made, is simply a way of heightening some aspects of the sonic experience. Well again I don't have some definitive view of the role of music in life, or good and bad ways people can use music, or anything like that. I don't see music so much in terms of a 'function', nor do I see artists as necessarily having particular tasks. But I guess in a broad sense I see music and the process of making music as offering as rich and profound ways of engaging with and experiencing the world and life. The emotional efficacy of sound is an extremely profound and precious thing, particularly in a world which offers so many ways to disconnect, and disengage, and I very much value this intimate and relational aspect of sound. I think it's actually political to think of sound in this way. Having said this however, I am sometimes disappointed in the lack of political engagement in some parts of the sound community. I am a very leftwing person, and I would like to find the ways to use sound to engage with some of these very urgent questions our world faces in terms of the environment, class, inequality and wealth distribution, war, displacement and refugees. I don't think I have really found a project which is able to do this in a way which doesn't replicate some of the aspects of the left I don't like so much, like being overly proscriptive and didactic, but it's something I'm speaking about with people. 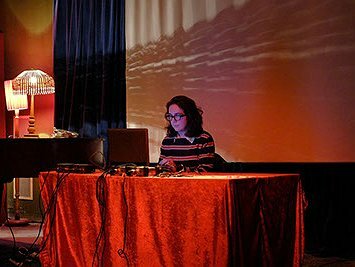 And there are people doing some good work in this area, like the Australian composer Leah Barclay for example who has founded Biosphere Soundscapes to explore the ways field recordings can inform scientific research. To really listen to a piece of music, or sound, or to a person is a very remarkable and wonderful thing to do. Again, it's a relational act, to really listen is to create a relationship with a piece of music, or with a person, it is a creative and constitutive act. I choose carefully who and what I listen to, and I do it because to give that time and space to something in a way is to build it into your world, and I try to be conscious of what sort of world I make for myself. There is lots of very interesting writing on listening and sound art in particular, and Salomé Voegelin writes about the listener to sound art collaborating and inventing the work anew in her or his listening. I very much like this idea. For my label I'm engaged in this side of things, and in the past I worked for many years as a journalist, not in music but this work always involves contact with PR companies, so I am very familiar with this world. I think it's very easy and quite brainless and boring to simply slag off journalism and journalists and even to some extent PR companies. Like any industry there are good and bad examples of people working in these jobs, some are very sincere and amazing people, others are not so much. With my background and my work with Flaming Pines I understand that it is important in terms of reaching journalists (I have never worked with a PR company) to be able to tell a compelling story about your work, and I have no problem with that. I think it's important to be able to explain as an artist what you do, why you do it, and why you hope people might be interested in it. This isn't about marketing, but trying to forge some relationship between what you do and the world in which you do it. For me, with Flaming Pines, I have been very lucky to establish many good relationships with music journalists and bloggers. I really respect what they do, many are simply doing it for the love of music and musical writing, and in the same way that music is an art, so too is writing. I'm sure there are loads of horrible stories about super mainstream PR companies working with bands, but all of this is very far from what I deal with so I can't comment on it. I have a great many ideas always on the go, and yes I definitely have some which I've not yet been able to realise for both technical and financial reasons. The main one, which was really disappointing, was a phone app dealing with place and sound art. But actually I am in the process of realising this now I think, so I will wait until it is a bit more developed before discussing it more! The emotional efficacy of sound is an extremely profound and precious thing, particularly in a world which offers so many ways to disconnect, and disengage, and I very much value this intimate and relational aspect of sound.